Karachi- Infinix Pakistan has finally announced launch of its advance selfie smart phone S3. 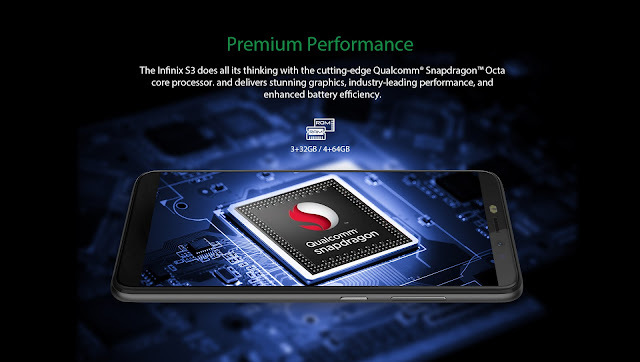 This smartphone follows the versatile innovative trend of Infinix and is equipped with some of the most advance features like 20 MP low light selfie camera, a much larger 18:9 infinity display, 1.4 GHz Qualcomm® SnapdragonTM Octa-core processor, Android 8.0 Oreo and FaceID besides fingerprint lock. As infinix has created its impression as provider of smartphones with unmatchable photography features from the very beginning, it has retained its reputation once again by introducing 20 MP low-light front selfie camera. S3 offers 3 levels of dual soft flash light according to the intensity of environment light which means that users can capture much brighter selfies in low light areas no matter how bad the condition is. The Sony IMX376 sensor of the camera is designed for color and light capture that allows users to take pictures in true colors. This is not the end. S3 offers 9 grades of selfie beautification from which the users can choose the best grade according to their own choice. Want to stand out in your pictures? No problem! S3 offers Bokeh effect that blurs the background and making everything about you just fantastic. Along-with a powerful front cam, this smartphone is equipped with 13 MP dual flash camera that offers 80 degree wide angle for capturing the moments. One of the most striking feature is its 5.7”screen with 18:9 infinity display that fits right in the palm. Being smaller in size, everything it has to offer is big. This display not only sets a new feature for uninterrupted and immersive experience but also provide more space to the users, especially for the gaming fans and those who are used to watching videos on their smartphones. This wider space further helps when it comes to the feature of multi-window wherein the users can switch between and use different apps with enough space and without having any difficulty. Bigger screen means more to see, less sliding, more browsing and more content to enjoy. Integration of infinity selfie feature with a wider screen makes your beauty go full screen, and that with just a single click! A powerful and efficient processor is what smartphones need to work efficiently. S3 is powered by a 1.4 GHz Qualcomm snapdragon octa-core processor that has emerged as a huge improvement from the last generation. Its higher performance offers higher GPS accuracy, stronger signals and better management of CPU and GPU, thus offering a better heat dissipation. The latest version of Android 8.0 Oreo powers Infinix S3 with less pre-installed APPs providing seamless experience with less power consumption. Its 4000mAh battery gives extra mileage to the stand by time that expands over 2 days for an average user. S3 comes with 3GB RAM and 32GB internal memory that is extendable to 128 GB. As the technology becomes more compact, the need of space grows even more. That is why the phone supports upto 128 GB of memory card and dual Sims with a dedicated micro SD card slot. With Infinix S3’s Face ID feature, users need not to worry about the protection of their devices as their face is the password to unlock their devices. It comes with a cutting edge feature of night light as well which is designed to filter the blue light at night. When the night light is activated, it gives a warmer tone to the colors thus protecting the eyes of users. Although all of these fun packed and amazing features are packed into 5.7” Infinix S3 which offers users to express themselves vibrantly in most innovative ways possible, it is being predicted that this smartphone will cost somewhere between 17,000 Rps to 19,000 Rps.